They started learning Carnatic music from their father Sri V.V.Subba Ram at an early age. They had their advanced training under the world-renowned duo Kalaimamanis Radha & Jayalakshmi. Presently they are under the scholarly guidance of Prof.T.R.Subramaniam. For, Shanmukhapriya, a quiet, calm and bold persona, graduated in zoology, music was always a part of her growing years and Haripriya, known to be a Tom-boy, specialised in English Literature and was part of the ‘Under-15 Women’s Cricket Team’! “Our parents insisted that we assimilate good culture and music. Name and fame were the last things we thought of,” says Haripriya. 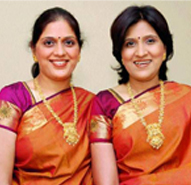 Priya sisters have twice been the recipients of the 'Best Female Vocalists' awards of Sri Krishna Gana Sabha and the Indian Fine Arts Society, Chennai. They have also received the M.L.V. memorial award. They have been conferred the titles 'Sangeeta Sarada' and 'Gayani Sironmani'. Shanmukha Priya and Hari Priya have received the prestigious 'Ugadi Purashkar 2000' from the Madras Telugu Academy for their meteoric rise in the Carnatic Music World.